Eye Doctor Federal Way, WA | Call Kosnoski Eye Care Now! We offer you an exceptional team of eye doctors and an advanced range of technologies to ensure that you receive the best vision and eye care in Federal Way, WA. Our optometrists provide all primary eye care for adults and children, and we pay special attention to each individual’s unique needs. We invest in getting to know you to help maximize your ocular health and vision quality. Contact your leading Federal Way eye doctor to schedule an appointment – we welcome new and existing patients! We also provide urgent eye exams and treatment in the event of an eye emergency; call for immediate assistance. Using state-of-the-art diagnostics, our Federal Way eye doctor performs comprehensive eye exams to evaluate your visual acuity and ocular health. We inspect thoroughly for signs of eye disease, such as macular degeneration, glaucoma, and cataracts. If you are diagnosed with ocular disease, we will instruct you to return for regular follow-up eye exams so we can watch your condition and provide the most effective treatment. Precise management of eye disease is one of our specialties, and it is the only reliable way to safeguard your sight and prevent future vision loss. People with diabetes are at an increased risk of damage to their vision. We will work together with your physicians to keep them informed of any ocular changes and the treatment plan we recommend. As your expert optometrist in Federal Way, we aim to help all of our patients with diabetes to protect their eyesight and overall well-being. After your eye exam, your Federal Way optometrist will issue a precise vision prescription, as well as discuss vision correction and the available options. Depending upon your needs and preferences, we will fit you with either glasses or contact lenses. Our optical collection features many designer frames and styles, and we stock a complete inventory of brand-name contact lenses. Our Federal Way eye doctor is also experienced in fitting ortho-k lenses for corneal reshaping therapy. Ask us for more info about this revolutionary process! See the Fantastic Sites of Federal Way, WA! Federal Way is a coastal city within the Seattle metropolitan area, founded originally as a logging settlement in 1929. Since then, this city has come a long way! Some of the best attractions in Federal Way are set in nature because a wide variety of plant life can flourish in the climate here. The Rhododendron Species Botanical Garden is a popular park and a paradise for all rhodie lovers. There are hundreds of rhododendron species blooming in lovely landscaped gardens. You can easily spend a few hours wandering along the gravel paths. Once you’ve exhausted all the flower beds here, we recommend going next door to visit the Pacific Bonsai Museum, a free site that displays about 40 of these miniature trees. Perhaps the most well-known park in Federal Way is the West Hybloes Wetlands. There is a boardwalk path that stands about two feet above the water, and you walk along it in between dense and shady trees for approximately a mile. Bring a picnic and take a break at one of the designated areas. Also in this park is city’s oldest structure, Barker Cabin, built in 1883, and the Denny Cabin, which was built in 1889 from trees cut down on Queen Anne Hill. If you’re looking for some indoor activities, The Commons at Federal Way has a good selection of large department stores and independent retailers, as well as a comfortable family theater. One of the best features of this mall is the warm and friendly attitude you’ll encounter from every Federal Way shopper and employee! 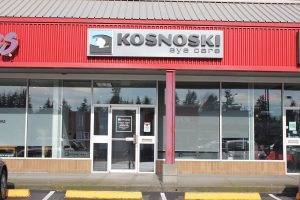 To reach Kosnoski Eye Care from The Commons, travel about 7 minutes along S 320th St onto 21st Ave SW.
Hungry and want to grab a bite to eat before or after your eye exam? Our optical office is surrounded by a flavorful variety of Federal Way restaurants: for Mexican fare, try Puerto Vallarta; for Chinese, the Imperial Palace is next door; for modern European, head to Pimienta Bistro and Bar.